De plus son canon de 122 mm le fera baptisé Tueur de Tigre . Son poids et son armement peut le faire mettre dans la même classe que le char Panther . A la fin de 1943 l’usine Kirov aura produit 102 JS2 qui seront utilizes pour la première fois au combat en février à Korsun Shevkenskovsky. Quand les premiers JS-2 furent disponibles ils furent intégrés dans des unités spéciales ou des régiments de chars lourds de la Garde (OGTTP). 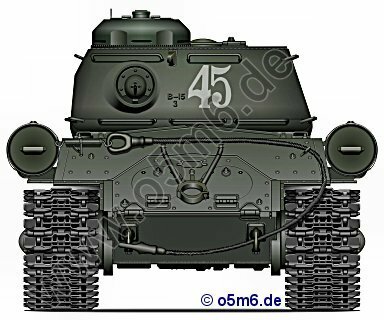 Early in the autumn of 1943, Soviets complete the first of the 3 prototypes of the new IS-1 (IS-85) heavy tank using design experience gained from their previous KV heavy tank projects. These new IS (Iosef Stalin) prototypes were systematically demonstrated before the special commission from the Main Defense Commissariat and with the completion of general factory trials the IS design was approved for production. Although the first production vehicles mounted the 85mm gun also seen on the T-34/85 medium tank, these initial IS-1 tanks were shortly converted to carry the 122mm M1943 D-25 gun before they were provided to the tank troops. 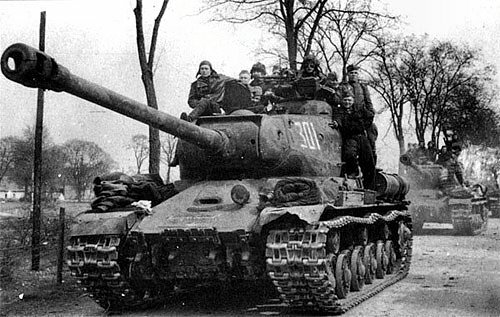 The new IS-2 tank weighed little more than its predecessor KV tank, but it had thicker and better-shaped armor that provided vastly improved protection. The overall weight was kept low by using a more compact hull and component design, as we shall see later. Once the 122mm gun was installed and series production continued, the new Tiger Killer was officially named the IS-2 Heavy Tank, although its weight and armor characteristics closely coincided with the German Panther medium tank. By the end of 1943, the Kirov Factory had produced a total of 102 IS-2 heavy tanks and they were used for the first time in February of 1944 at Korsun Shevkenskovsky. 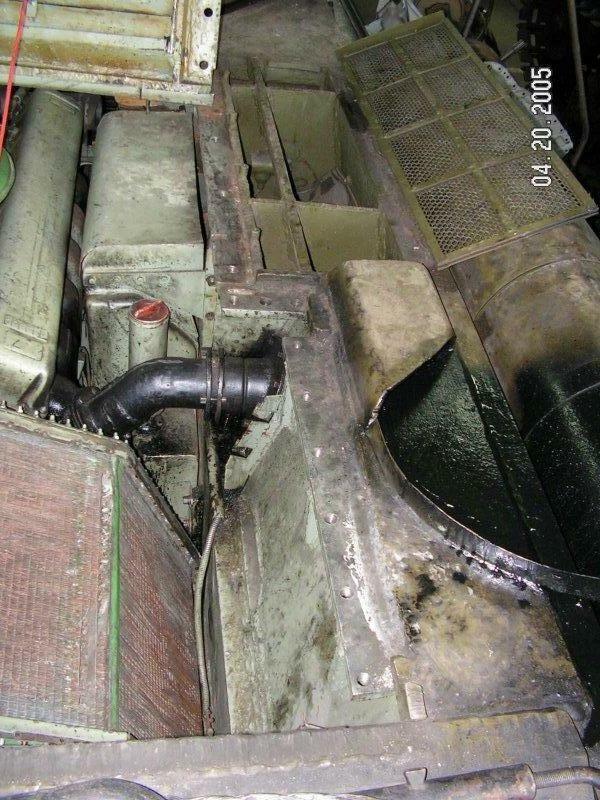 Although there were a number of external improvements to the IS-2 during its production and field use, there were relatively few internal changes made over the years. Total production of the IS-2 tank amounted to around 2,250 vehicles . Of these, approximately 250 were reported to have been constructed in the first quarter of 1944, 525 in the second quarter, 725 in the third, and 750 in the last. When the first IS-2 tanks rolled off the factory floor and out the door, they were placed in special new units designated as separate Guards heavy tank regiments (OGTTP). These units typically had 21 IS-2 tanks divided into four companies with five tanks each. The Guards units were also known as "break through" regiments indicating their powerful offensive design. Although the first IS-2 vehicles used this curved and gently sloping front bow casting, it was later replaced in 1944 with either a new casting or a welded plate nose, both of which had a straight 60-degree slope from glacis to the top of the hull. The UZTM plant made the welded noses, while factory N°200 made the cast types. 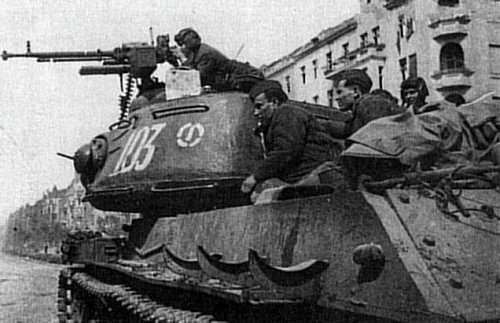 The IS-2 was one of the first production Soviet tanks to remove the traditional second driver/hull machine gunner from the bow of the tank, providing additional space for fuel tanks. In place of a ball mounted MG on the front plate, a DT machine gun was mounted on the right side of the hull behind the driver and up near the turret ring. It was fired via a remote control firing cable from the driver's position. 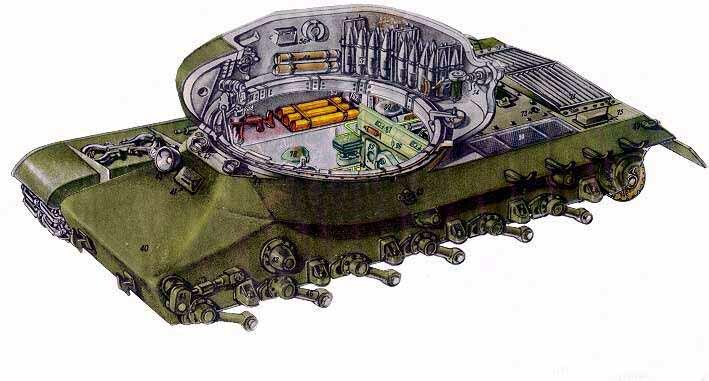 The tank of new generation illustrate perfectly the new reorientation of Soviet's combat strategy at mid-war from using tanks for infantry assault to tank hunting and killing machines. As a result, the second driver in the hull was deemed unnecessary and the crew was reduced from the traditional five soldiers to only four, the driver then placed in a central position in the bow. The commander is located inside the turret at the left rear, the gunner is to the left of the main gun, and the loader is to the right. Both the gunner and loader are provided with over-head periscopes and the commander has a non-rotating turret cupola incorporating vision blocks that provided a 360-degree field of view. He also has a rotating periscope in his cupola hatch. A round roof hatch that is flush with the turret roof is provided for the loader on his side of the turret. 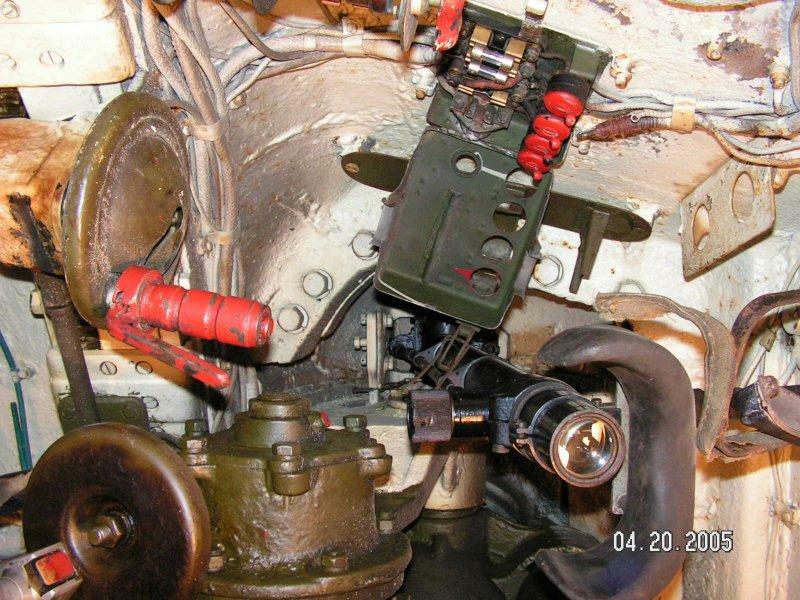 Initially, the 122mm L/43 gun mounted in the cast turret retained its original interrupted screw breech, showing its ancestry from the already proven D-19 field gun. 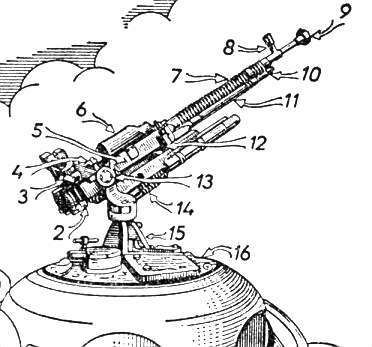 But the screw field gun breech was replaced (by early 1944) with a horizontally sliding block, semi-automatic type, and of course the recoil cylinders and elevating mechanisms were altered from the field gun to fit into a turret. Because the 122mm ammunition rounds were so huge, they were provided in separate pieces, a projectile and a charge cartridge, but even so only 48 complete rounds could be stored inside the tank. Although a number of ready rounds were strapped into easily reached racks in the turret, most of the ammo was stored in sheet metal boxes down on the hull floor and, as we have seen in the T-34/76, these boxes were often covered with rubber floor mats. 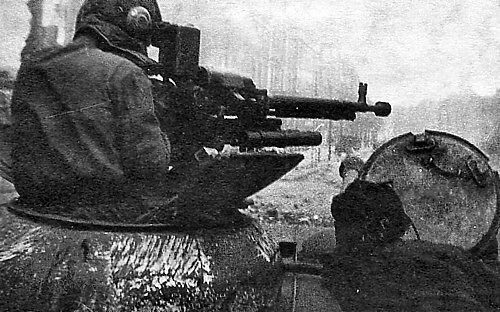 There was no turret basket in the IS-2; the turret crew seats were either suspended from the turret and rotated along with it (commander's) or the seats were supported on tubes that rose from the center of the floor and also rotated with the turret (gunner and loader). Sur le dessin de la tourelle on peut voir la positon des munitions stockées Le moteur V-2IS, quatre temps, type V, 12cylindres est situé à l'arrière de la coque séparée du poste de combat par une cloison pare-feu Le moteur diesel d’ environ 520 CV permet de propulser le char à une vitesse d'un maximum de 37 kms/h sur route et à environ 28 kms/h en tout terrain Il a une autonomie de 240 kms. 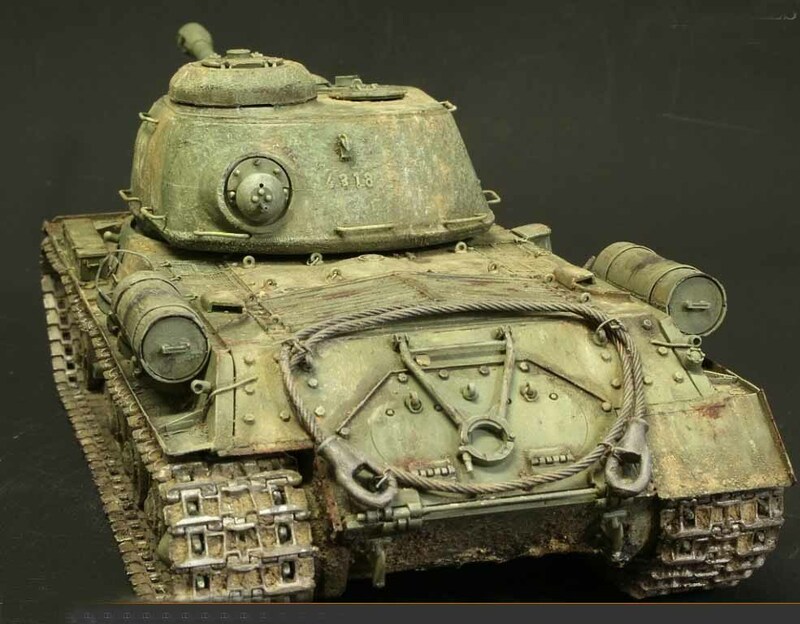 By the time the IS tanks were being manufactured, the Soviets had plenty of technical experience with casting large pieces of armor, and the IS-2 turret became one of the biggest castings they manufactured during the war. 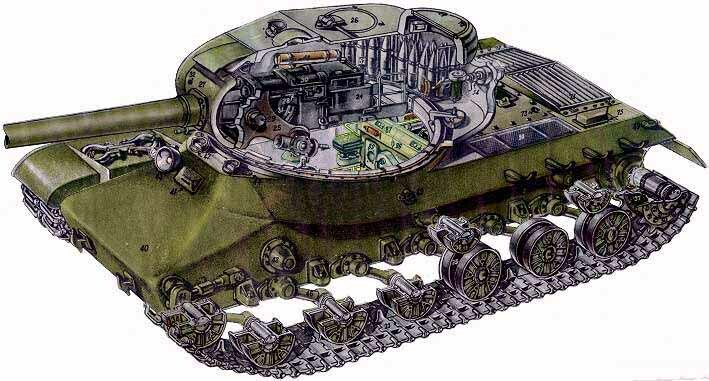 Although Western writers have tended to criticize the coarse standard of Soviet armor finish, the urgency of tank manufacture in 1943 did not warrant lavishing extra time and energy on unnecessary refinements. Over the course of its production, the turret was gradually changed. 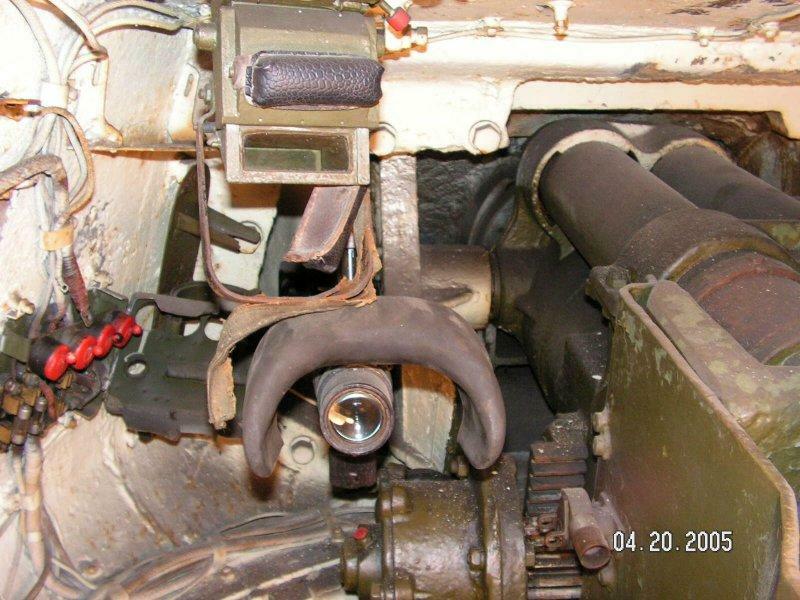 The early IS-2 tanks that were manufactured in 1943 were originally designed to have installed a D-5T 85mm gun in their turrets, and they had a narrow opening for the telescopic sight just to the left of the gun. When the 122mm D-25T gun was placed inside these same turrets, it was very hard for the gunner to use his telescopic sight, as it was so close to the gun. So, in mid-1944 a new turret with a larger sight opening that was also shifted slightly to the left was produced. Also at this time the thickness of the turret's mantlet was increased, along with the lower hull sides. The new turret also moved the commander's cupola slightly to the left and the gunner's PT4-17 periscopic sight in the turret roof was changed over to a Mk.4 type. About this time a Model 1938 12.7mm DShK anti-aircraft machine gun was installed outside on the commander's cupola to provide some protection from strafing German aircraft. This drawing of the turret shows the general arrangement of projectile storage in the turret bustle, where many AP-T and HE-Frag projectiles were stowed. 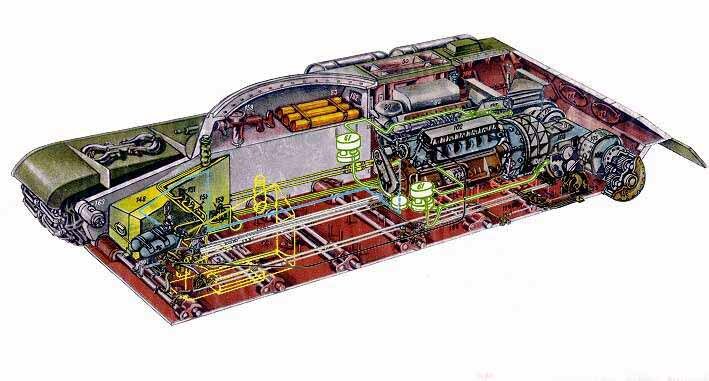 The V-2IS, four-stroke, V type, 12-cylinder engine is located in the rear of the hull, and in this drawing some of the firewall separating the fighting compartment from the engine compartment is visible. The diesel engine produced around 520hp to push the tank a maximum of 37 kms/h on the road and roughly 28 kms/h cross country. Maximum range with the internal fuel was 240 kms. Cette vue sans la tourelle vous permet de voir l'intérieur de la coque et des autres composants internes du JS2. A l intérieur du châssis le long du blindage juste derrière le conducteur, on trouve deux séries de racks de stockage vertical supplémentaire pour des cartouches en laiton, (ici nous trouvons seulement représenté le support sur le côté droit). Comme sur de nombreux chars soviétiques de la 2e Guerre mondiale, le moteur V-12 diesel peut être lancé par temps très froid à l’aide d’air comprimé, Les bouteilles d'air sont situées en face du conducteur. Stripping away the rest of the turret and some additional portions of the hull provides this view of additional internal components of the IS-2. 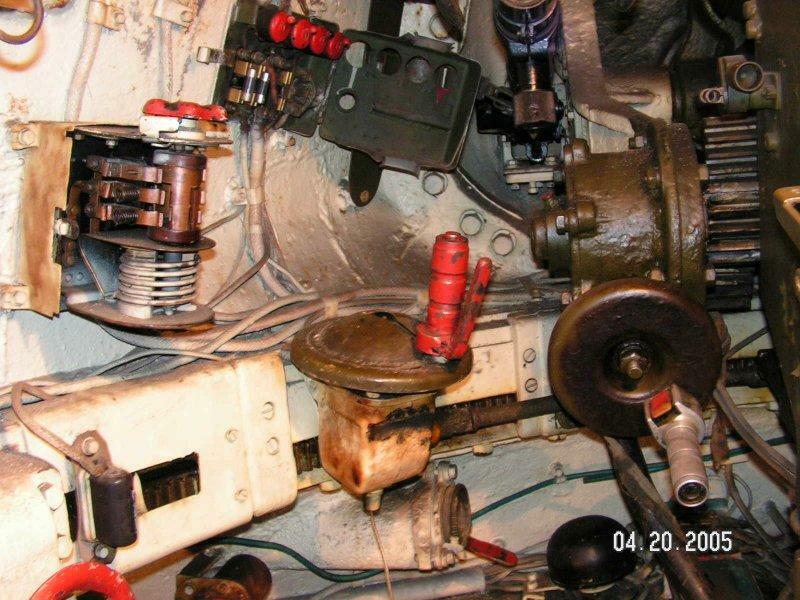 In the turret area you can now see the support tubes for the gunner and loader's seats, as well as a part of a third tube (conduit) carrying electrical and radio wires up to the turret equipment. Down below the seats are some of the sheet metal storage boxes for shell charges, and a starting crank handle is visible on the firewall at the rear. 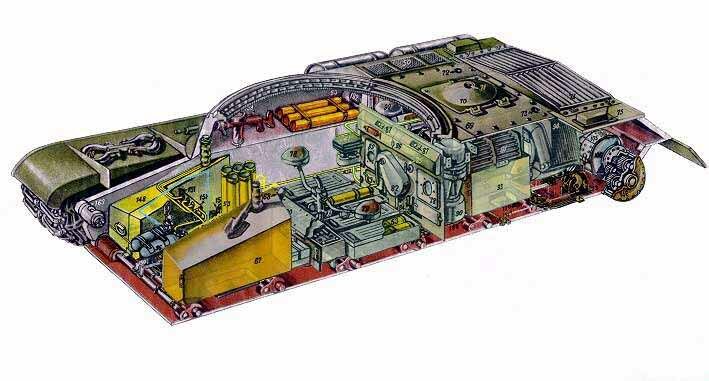 Up forward is the central driver's position, flanked by the two large diesel fuel tanks, although additional fuel tanks are located in the rear on either side of the engine. Total fuel inside the tank was around 520 liters, but like on lot of soviet tanks we found additional fuel and oil drum tanks were normally lashed to the sides of the engine compartment. The oil drums were particularly important as the V-2 engine used huge quantities of oil. Along both hull walls, just behind the driver, are two sets of vertical storage racks for more brass charge cartridges, although only the rack on the right side of the hull is drawn here. 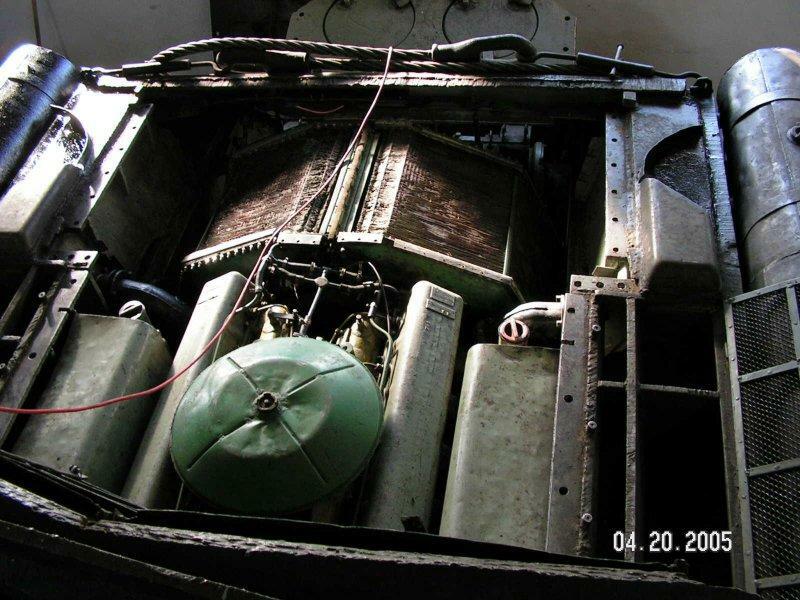 As we have found in many Soviet WWII tanks, the V-2 diesel engine could be started with compressed air in very cold weather, and the air storage cylinders are located up in front of the driver. 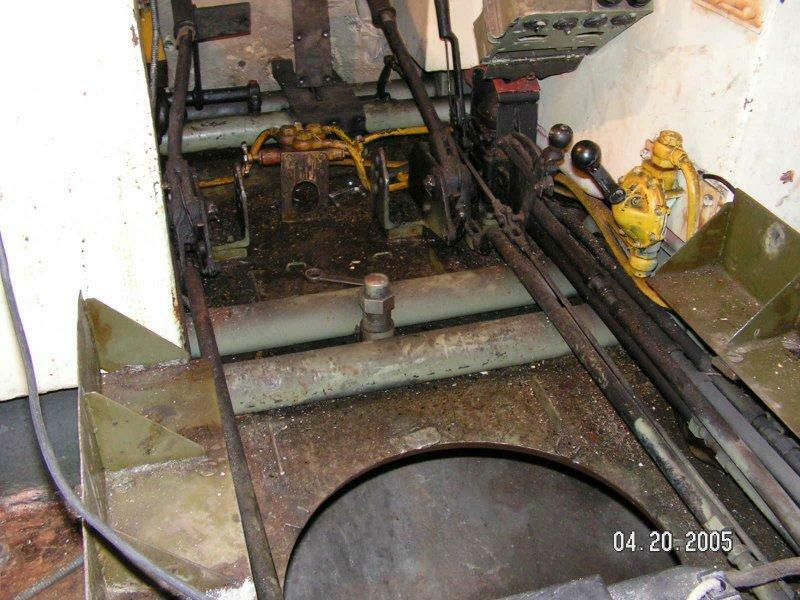 A DT machine gun is shown located in the right forward hull, but back directly under the turret ring. C’est un modèle particulier en forme de fer à cheval recouvrant de manière efficace les côtés et le dessus du grand ventilateur de refroidissement. 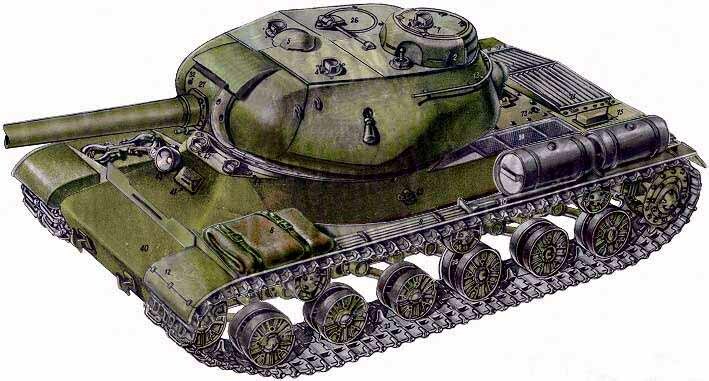 The IS-2m, or IS-2 Model 1944, was the vehicle's name given when the front bow armor was changed to a straight slopping plate, the gunner's PT-4-17 periscope was replaced with the Mk.4, the wider turret mantlet was substituted, and the 12.7mm DShK heavy machine gun was mounted on the turret cupola. On the floor surrounding the tube supports and collective are a number of stowage boxes for 122mm ammo Also down there are battery boxes, Just forward of the battery boxes are the vertical brackets for storing charge cartridges They were approximately five charges in each rack. La mitrailleuse coaxiale est remplacée par une MG placée à l arrière de la tourelle c’est une 7,62 mm DT 1929, Elle est mise à feu via un câble par le conducteur Contrairement à la version d'infanterie la version DP la DT «T» voulant dire pour char le DT a une crosse rétractable en métal ainsi qu’une poignée revolver en bois. Le chargeurs ronds utilisés dans les chars soviétiques sont des chargeurs à 60 coups . Ils sont donc plus gros que les chargeurs pour les MG DP . Normalement un système de visée (présent sur le dessin) est monté sur ces MG . It is the position of the gunner the commander is directly above us. He as for the communication a radio transceiver 10 RK and an intercom system at his left Number of racks for 7.62mmMG ammo drums are also on the left and on the other side we found the radio. 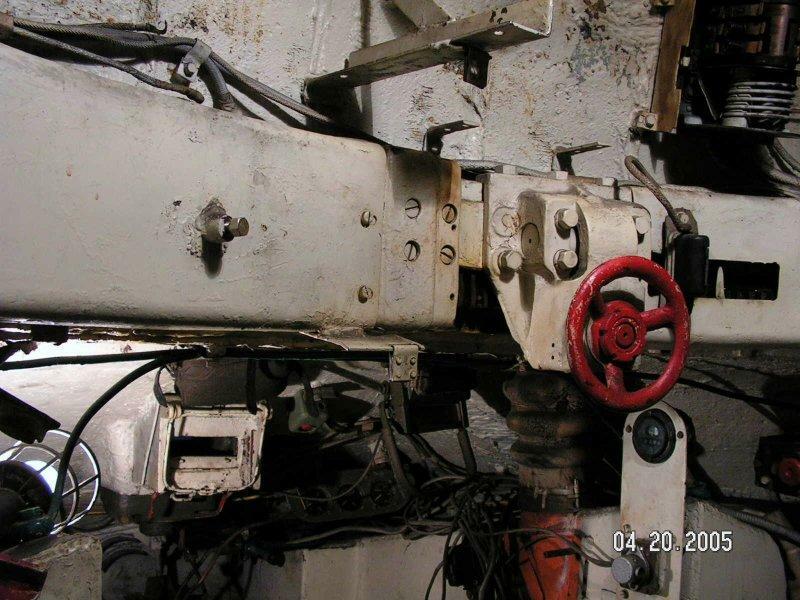 Directly forward is the dark gunner's seat with his elevation and traverse hand wheels, and the D-25T gun breech . The commander's cupola is non-rotating, but he has six vision blocks who provide a complete 360degree view There are protective face pads around each cupola block and shattered glass blocks can be easily replaced by opening the latch under the frame. 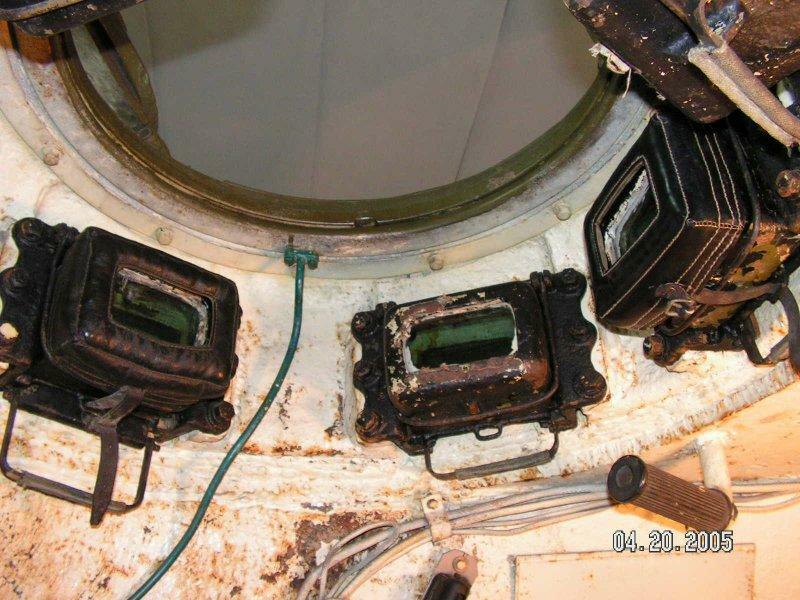 A rotating periscope is mounted in the center of the cupola hatch On the turret ceiling, just forward of the cupola, is a Soviet interior dome light, typically with a blue lens installed. La tourelle est mue soit manuellement soit avec un moteur électrique. La manivelle se trouve sur la gauche. Mais l'élévation se fait uniquement en manuel . L'arme n'est pas stabilisée mais elle est d’un entretien et d’une utilisation aisés. Une petite boite de connexion radia se trouve à coté du point lumineux . Et dans le plancher nous trouverons des caisses vertes pour le rangement des douilles et un rack de rangement vertical pour munitions du canon. 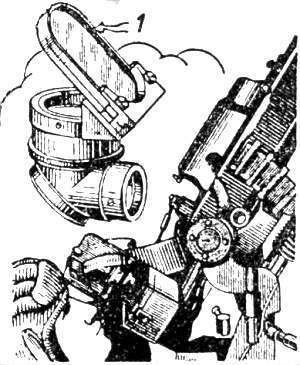 Turret traverse was manually by hand or powered with an electric motor, the hand wheel is see on the left. But gun elevation was only manual. The gun is not stabilized and the laying equipment was fairly simple and simple to operate and maintain. Elevation of the big gun was from -3 to +20 degrees. On the the loader's side of the turret we found black electric turret ventilator is at the upper left over the gun, and the mount for the 7.62mm DT coaxial MG The loader's Mk.4 roof periscope is to the right of the ventilator and further right is another interior dome light. Forward of the periscope is another vertical rack for four DT MG ammo drums and below a rack for the electric motor and gearing for powered traverse. A small radio connect box on the turret wall under the dome light is for the loader. 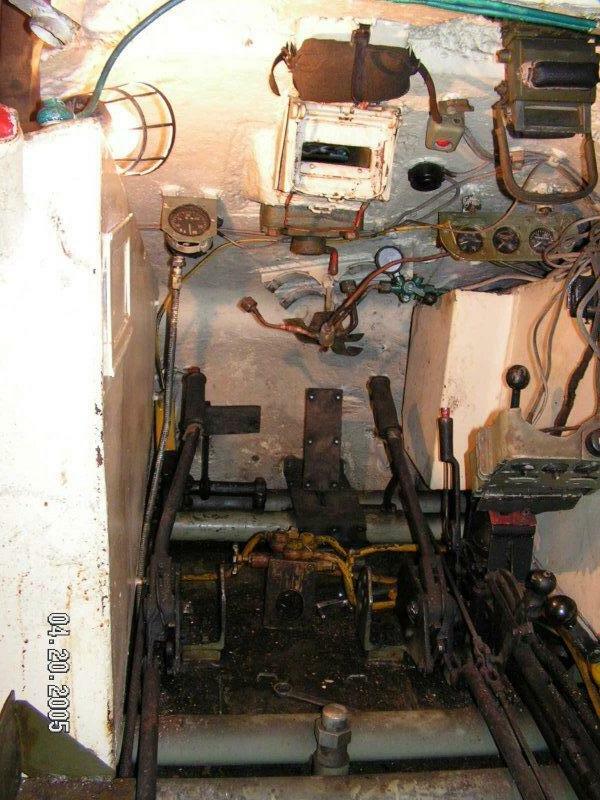 Down on the hull floor where is green 122mm ammo boxes and the vertical rack for a few charge cartridges on this side of the forward hull are seen under the turret traverse motor. Par la trappe ouverte du chef de char , nous avons accès à la MG de 12,7 Cette MG a été montée en position AA et elle fut utilisée à la fin de la guerre, et au-delà. La DShK est me MG lourde standard soviétique Elle était utilisés comme arme d'infanterie standard, ainsi que comme armement coaxial sur les véhicules blindés. Elle est née d'une coopération entre Degtyarev et Shpagin. Le mécanisme de l'alimentation est un unique bloc rotatif qui est protégé par un carter en acier embouti positionné au-dessus de la culasse mécanisme. 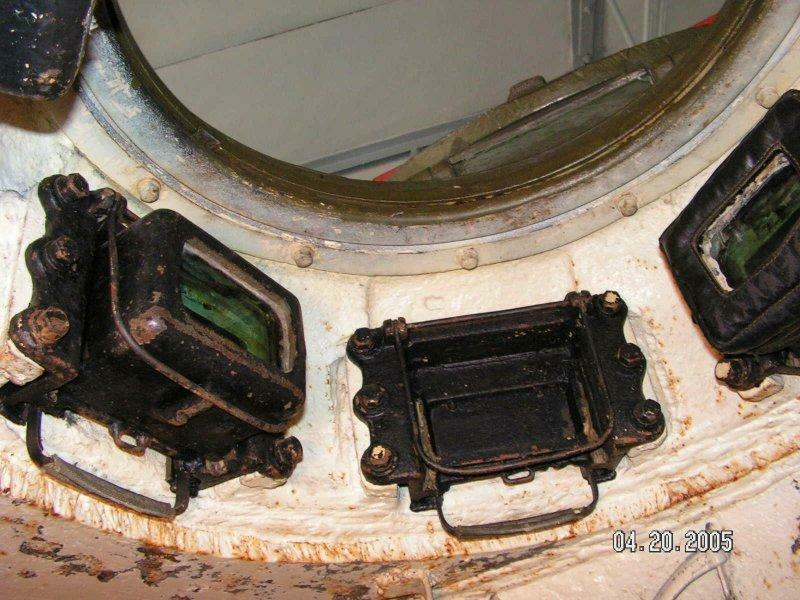 By the commander's position with the hatch open, we would have access to the 12.7mm MG up on his cupola. The MG was mounted and the anti-aircraft sight was used at the end of the war, and beyond. The DShK was the standard Soviet heavy machine gun for most of the war, used as the standard infantry gun as well as secondary armament on their larger armored vehicles. She was born by an association between Degtyarev and Shpagin. La MG DShK ressemblait à la MG , avec ses poignées, de déclenchement monté sur la plaque arrière, et le canon avec des ailettes de refroidissement et de frein de bouche large soudée à l'extrémité du museau. 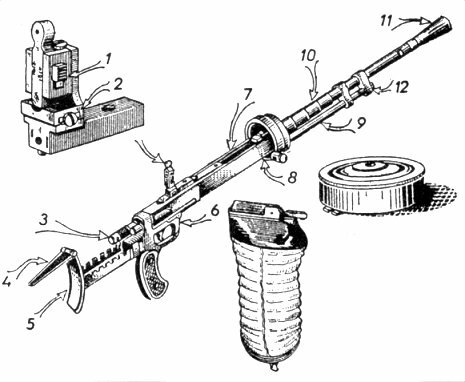 À l'instar de la Mitrailleuse US calibre 50 Cette MG a servi avec les forces soviétiques après la Seconde Guerre mondiale, et de nombreuses mitrailleuses sont encore en service aujourd'hui. DShK resembled the DS machine gun, with spade grips, trigger mounted on the back plate, and barrel with cooling fins and large muzzle brake welded to the end of the muzzle. Like US caliber 50 this MG served on with Soviet forces well after WWII, with many still in service today.